iRacingConfig is a free iRacing desktop app that allows you to edit all iRacing INI files simultaneously using a simple interface to create a single profile that you can edit, copy and apply to iRacing at any time. iRacingConfig was created to make it easy to manage multiple config profiles that you may need for different purposes such as VR racing, video editing, test sessions, watching replays, frame rate testing etc. It allows you to create multiple profiles that you can apply to iRacing before its run to save you from having to startup iRacing, make changes, and then restart it for the changes to take effect. It works by simply loading the existing iRacing ini files into a single table and saving them as a single profile. You can create as many profiles as you want. To apply a profile you just select it and then click the 'Install' and the app will backup then overwrite your existing iRacing INI files. iRacing will pickup the new settings the next time it runs. The app is completely portable and all profiles and settings are contained within the same folder as the app. It doesn't need to be installed or be running when iRacing starts or runs. 32-bit and 64-bit versions are supported. be installed on your computer. This program converts your iRacing replay's into edited video files for uploading to youtube. It overlays the race with leaderboards and other race data. It creates 2 videos from your replays; the full replay and a 10 minute highlight video. The highlight video will contain the battles, incidents and remove any boring bits from the final video. These files store all the settings for iRacing which you would normally edit whilst in iRacing using the options menu. Some settings do not take affect until you restart iRacing. So normally you have to start iRacing go into the menu make your changes, quit and then restart iRacing. iRacingConfig was created to allow you to easily edit the settings before you start iRacing or choose an already preconfigured profile with all the settings you may need for a particular type of session such as VR, Desktop or Replay editing etc... This means you can simply start iRacingConfig, choose your config profile, apply it then start iRacing. Simply extract the iRacingConfig zip file you have downloaded to a folder and then run the iRacingConfig.exe file. There is no installation required. It is completely portable. All files are stored in the single root folder that you extract it to. It can be run from any folder provided you have read/write permissions to the folder. When you first start iRacingConfig it loads all the settings from the above files into a single table and collapses the settings into their group headings. Headings are highlighted in blue. To Edit any settings just click the heading which will expand out all the settings below it. Click the value you want to change and type in the new value for the setting. Press enter and the cell will turn yellow to indicate a value has been changed. Make as many changes as your want. Once you have finished making changes simply click Install to update iRacings INI files with the new settings. This profile always loads the current iRacing settings. When you make changes you can only click install which will immediately update iRacings current settings. When you edit a profile other than the iRacing Current profile you can save the settings without actually installing them in iRacing. You can make as many profiles and setting changes as you like. Whenever you want a profiles settings to become iRacings current settings just select the profile and click install. 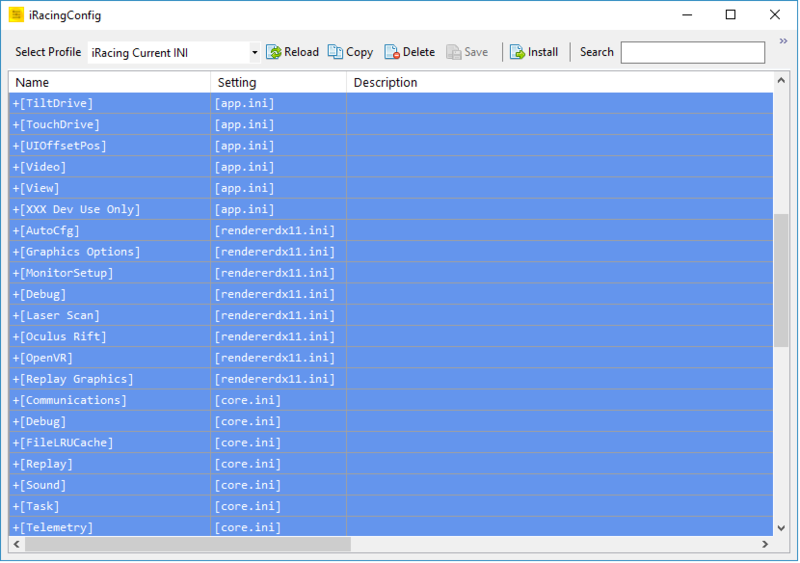 Selecting a profile loads all the settings from \iRacingConfig\Profiles\<ProfileName> into the table. If you select the iRacing Current profile it will load the current active settings directly from iRacing. If you are editing iRacing Current and then select another profile all changes will be lost. Right-clicking the table allows you to expand or collapse all lines. There is also an option called Google it which will start your browser and search for any text that you have highlighted. Any comments you add to the description of a settings will also be saved. Every time you click the install button a backup of the existing INI files is copied to the Backup folder. Any backup ini files that are older than 30 days are deleted by iRacingConfig on startup. Right clicking any where on the main table will show a context menu that allows you to expand or collapse all the settings. There is also a menu item called "Google it" which will start your default browser and search for the selected text + iRacing on the web. To upgrade an existing version just copy and paste all files over your existing files. Existing profiles will not be affected. Added tooltip to the Profile label in the toolbar that shows the date and any profiles that have identical settings. Increased width of profile drop down box. Fixed a bug when copying profiles where camera and core ini files were not copied to the new profile. Fixed a bug where the iRacing current profile was not automatically refreshed after installing alternate profile. Uploaded iRacingConfig to www.virustotal.com for scanning. 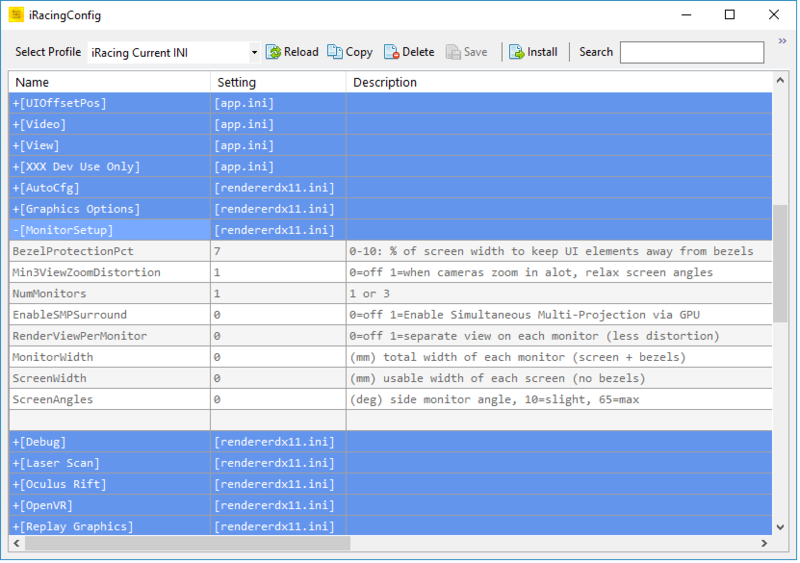 Added option to hide camera.ini settings. Added option to hide core.ini settings. Added option to launch the iRacing UI instead of the website. Added option to automatically close iRacingConfig if iRacing is detected running. Added check to make sure ini files are in the expected directory. Increased default window width to ensure all toolbar icons fit at startup. Changed ini file padding for the renderDX11.ini to be the same as iRacing's default. Added new column that shows iRacing's in-game name for relevant settings. Added vertical gridlines to the table. Made a few minor cosmetic changes. Signed iRacingConfig.exe with DigiCert certificate. Uploaded iRacingConfig-11-JUN-2018-V115.zip to www.virustotal.com for scanning. Fixed bug where INI files in the backup folder were deleted based on the date created rather than date modified. iRacingConfig's main window size, location and state are now saved on exit. Changed incorrect text which stated that unsaved changes would be lost when copying profiles. Changed some of the cell colouring on editing and saving. Fixed a couple other minor bugs around the saving and copying of profiles and the general prompt messages. Uploaded iRacingConfig-03-JUN-2018-V110.zip to www.virustotal.com for scanning. Uploaded iRacingConfig-03-JUN-2018-V100.zip to www.virustotal.com for scanning.